Body Solid Powerline Weight Bench Review - With Video! Are you looking for a sturdy well-made bench for under $200? Body Solid’s Powerline weight bench might be what you are looking for. No need for tools to fix this bench together. Powerline’s PFID125X bench is designed straight for use out of the box. With 7 adjustments it’s certainly a versatile bench and will turn any space in your home into a working home gym. Our favourite feature of this bench is its user and weight load, it’s tough, durable and stable and should take the retailers maximum 500lbs. With a weight load of 500lbs it’s going to appeal to a wide range of users from bodybuilders to general fitness fanatics, in fact almost anyone looking for a mid-range bench for dumbbell and barbell workouts will be pleased with the quality of the body solid bench. 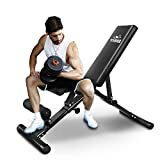 The bench has been designed to provide you with all the positions a commercial gym bench would offer but at an affordable price, the bench is nice and sturdy and does feel solid, designed primarily for dumbbell training. If you are thinking of using this bench for barbell pressing, the relatively high weight load should make it ideal for use with a power rack. Spending slightly more $’s on a mid-range bench like the BodySolid does give you the reassurance of quality and with quality, we usually find stability, by far the most important feature of any weight bench. When lifting heavy weights you’ll be happy to hear this bench copes very well with no seat or frame wobble. Surprisingly it’s quite light at 25kgs, personally, I prefer slightly heavier benches around the 30-40 kgs, I feel extra weight gives a more solid feel, but even at 25kgs, the design of the Body Solid makes it feel like a well made sturdy bench not dissimilar to benches costing twice as much. The Bench has a well-made racking feature making it very easy to adjust the bench to any of its 7 positions. I was hoping for an adjustable seat but again as we find with many benches under the $200 mark they leave out this feature. We love the built-in wheels in the rear stabilizer, the bench folds flat for ease of storage, really handy if you are training in the bedroom and you want to store it under the bed. The idea of the front leg brace is to keep the body in alignment whilst in a declined position, most importantly helping keep your back straight preventing injury. Body Solid has been around for a couple of decades, they make high quality, strength training and exercise equipment. Body Solid machines feature innovative technology and distinctive styling that suits your home. From space-saving designs that suit any room, to full-sized gym systems, Body Solid is a company you can trust and a company who give long guarantees with their products, most of their products receive high 4-5 star reviews on Amazon. The Bodysolid powerline bench is designed to be very similar to the benches you find in a commercial gym, and we can safely say the bench is not too far off. The metal adjustable bar seems to be solid and a much better idea than the pin locking system some of the lower end budget benches use. The seat padding is not too soft, and not too hard to feel uncomfortable, this allows you to fully focus on your lifts. If you are a seasoned trainer you will know a tapering back support is normally a good idea as it will allow you to move more freely for certain movements.We were glad to see the body solid bench has this incorporated into its design and works well especially for movements like the bench press and flys. For the first time in our bench reviews, we’re missing the assembly instructions, this one comes ready assembled straight out of the box! This Body Solid bench is built to last, if anything goes wrong you do have the 10-year guarantee to fall back on, The Body Solid lift and lock adjustment bar feels like it would take a lot to break, the simplicity of its use is its selling point. There have been a few complaints of the gap between the bench seat and the back support, this is fairly common with the lower end benches and if you think this might be something that may concern you, you may want to think about putting a towel between the seat and back support gap to cushion your back. With over 30 exercises to choose from, you’ll be able to use this bench for rack and dumbbell workouts. 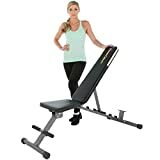 Body Solid’s bench features 7 adjustable positions including incline, flat, and a – 18 for decline, you should have no trouble getting the most from this bench, as said earlier it’s a fully adjustable gym- like weight bench. Check out our other popular articles in this category, there’s some great solid models you might like to see before you make your mind up. Summary A versatile weight bench by Body Solid, it will make a great addition to most home gyms, 7 adjustable positions will offer you a wide variety of exercises. 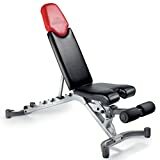 A stable easy to store weight bench for the beginner and intermediate user, even serious bodybuilders will get some valuable dumbbell use from this bench. CAP Barbell Deluxe Utility Bench Review – With Video! 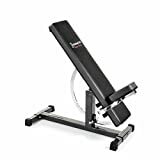 I have been looking to replace my flat bench with and adjustable bench since I want to be able to do more than just bench press. I like this model as I can fold it up for storage since I dont have much space in my home. I do have one question. Does this decline too so I could do decline bench press in addition to incline? I may not be your usual customer. I’m middle-aged and have osteoporosis. But I am trying to deal with my condition in a natural way with nutrition and exercise. I’ve been using hand weights, but I think I would benefit even more if I had a bench. I prefer to work out at home. I like what you say about this bench being affordable and lighter. I’m small, so it doesn’t need to be super solid and sturdy. I also like the idea of a ten year warranty. I’m def going to check this one out. Thanks for the great review. Great video, too! Nice to see it in action. Glad you like the bench Stella! Don’t forget the Body Solid weight bench folds flat for storage another very useful feature of this bench and even though its lighter than most the bench still remains very stable.